The Venetians were famous across Europe for their maps. Fra Mauro, a member of the former Camaldolesian monastery on the isle of San Michele held such international renown as a cosmographer that King Alfonso V of Portugal commissioned a world map from him. 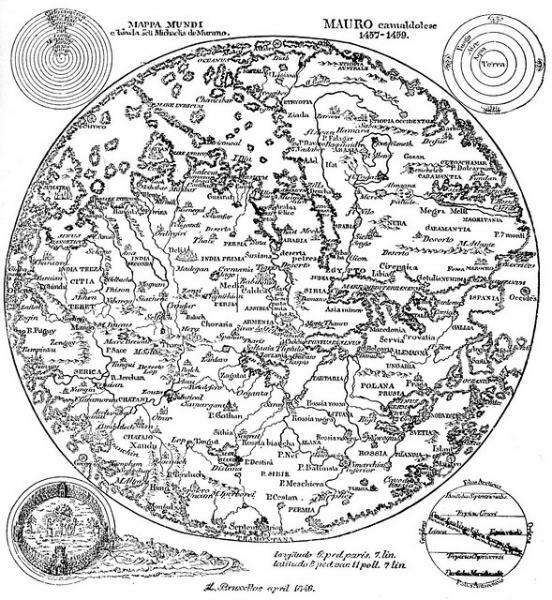 None could match it for accuracy in showing the dimensions of the world of 1459. A copy of the map is one of the highlights in the Biblioteca Nazionale Marciana. When Fra Mauro presented the map to a Venetian senator, the senator was enraged to find that the city was so small. Mauro tried to explain: compared to the vast extent of the world, Venice was indeed quite tiny. The senator listened to his reasoning, then ordered him as a patriotic son of the Republic: ‘Strenze el mondo, e fé Venezia più grande!’ (‘Make the world smaller and Venice bigger!’). my map...was only one version of reality. It would only be of any use if it were employed as an instrument of the imagination. It occurred to me that the world itself should be seen as an elaborate artifice, and the expression of a will without end.